If you’re a mother who has ever read a back-to-work article or blog post, you’ve probably heard references to hot tea – the fabled drink that we all get to try once we return to work after maternity leave. It’s usually mentioned in tandem with adult conversations – two luxuries that we miss during maternity leave; two silver linings that can help get us through those first few tough days back at work. And the thing is, hot tea continues to be the domain of the office – at home, nothing really changes. It’s not just when babies are small that managing to prepare and drink a hot beverage is a challenge. My kids are nine, seven and five, and I suspect that eight of every ten cups of tea I make are poured down the sink. And each time, I shake my head at my own ineptitude, yet know I’ll do it all again. I boil the kettle. I go back to helping my seven-year-old with her reading. I get distracted by the five-year-old skimming cars across the floor – like stones across a lake, only far more likely to damage the TV screen or any passing human. I boil the kettle again. Because I’m not taking chances – the water might have cooled down. I want this tea to be properly, perfectly hot. I take out a cup this time, bringing things to the next step. I reach for the tea-bags, but my nine-year-old falls off her chair at the same time and needs a hug. Then the small boy needs a hug because he’s feeling left out. The seven-year-old asks if she should start over on her reading because I wasn’t listening. I sit down to pay attention, postponing my tea for another few minutes. Once she’s done, I hoosh them all into the sitting room for TV time, and let out a deep breath as I boil the kettle a third time. I finally put a teabag in the cup. I even get the hot water in, and then leave it for a few seconds to brew, while I carry some laundry upstairs. I look into the girls’ room – there are seventeen socks on the floor. How can two kids possibly wear that many socks in one day? I pick them up, along with loom bands and hair clips and random bits of paper, then go back down to finally have my tea. But it’s gone too far – it’s tea-stew, black as tar. No good – down the sink. Start over. This time I stand by the work-top until the teabag has been in for just the right amount of time – I’m taking no risks. 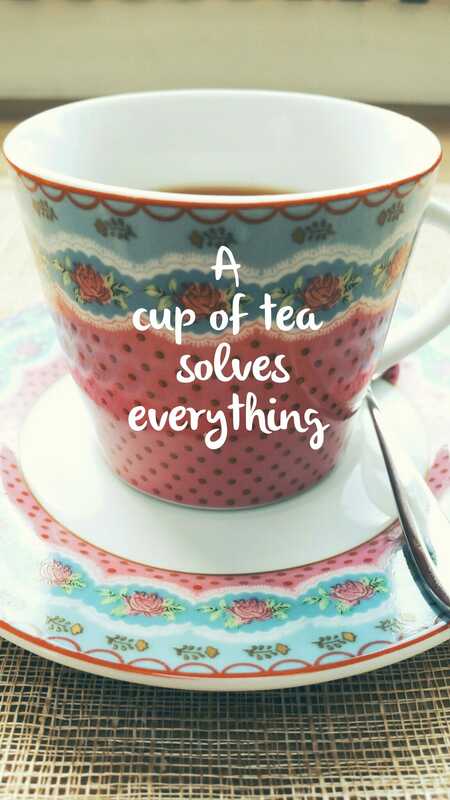 Finally, the perfect cup of tea is ready. It’s too hot to drink, so I run back upstairs to organise uniforms for tomorrow. The small boy follows me up. He’s helped himself to yogurt and it’s all over his hair. Sigh. I run the bath. He’s delighted. Me, not so much. Tea? Cold. It’s an everyday occurrence – today there’s yogurt and bath and laundry; tomorrow will be homework and fights and emails that can’t be ignored. There’s never enough time for anything anymore, so multi-tasking is the only option. Never leaving a room without something in hand to bring to its rightful place. Making school lunches while washing dishes and answering messages. Hanging up uniforms, searching for shoes, kissing sore knees. Tidying, clearing, folding, wiping, straightening, minding. Minding the kids – above all else – being there when there’s a sore finger, a sad story or a spilt drink. Helping with homework, helping with shoes. Brushing hair and touching cheeks. Wiping noses, wiping tears, returning smiles to small faces. When they no longer need me for more than a lift to a disco or help with a loan, I’ll enjoy the down-time and the me-time and all the hot drinks I want. But for now, I’m OK with pouring yet another cup down the sink. The cold tea years are tough, and they sometimes seem impossible, but they are also short, and each time I look back – often only when I look back – they are wonderful. What a perfect description of the ‘cold tea years’. I’m going through this currently. It’s a mad, mad, mad world in time. Ive gotten rid of my electric kettle. Ive moved to a whistling one, for a gas ring. At least this way i can remember boiling the water! Getting the tea bag to the cup is always an added bonus. Now I want a whistling kettle – that sounds way more fun than my ancient (not in a good way) electric kettle from Dunnes! I’m living the cold tea life too, and I love that description. I’m going to borrow it. I think we are all there, literally and figuratively. And cold coffee too but not as frequently – I’m far more careful with my coffee. The only hot tea I get is when the kids are in school and, much as I love it, I don’t mind the rest of them going down the sink for much the same reasons as you. Children grow too fast! Ah yes! All of this! I get particularly sad when I find the half-made cup – with the bag still in it – an hour later. Our time will come. Won’t it???? Now you’ve got me sad in advance about the time when the house will be quiet – all the time, not just during the school day – and my tea-drinking will be undisturbed. Waaahhh. Why can I never be happy with what I have? Swap the tea for coffee and this is my life! It’s ok though? It’s being there and wanting to be there that is important. Our time etches closer but I wouldn’t swap right now for all the hot coffee in the world!